I am pleased to be in this country, where Francis Forgione was born and began his long and fruitful human and spiritual affair. 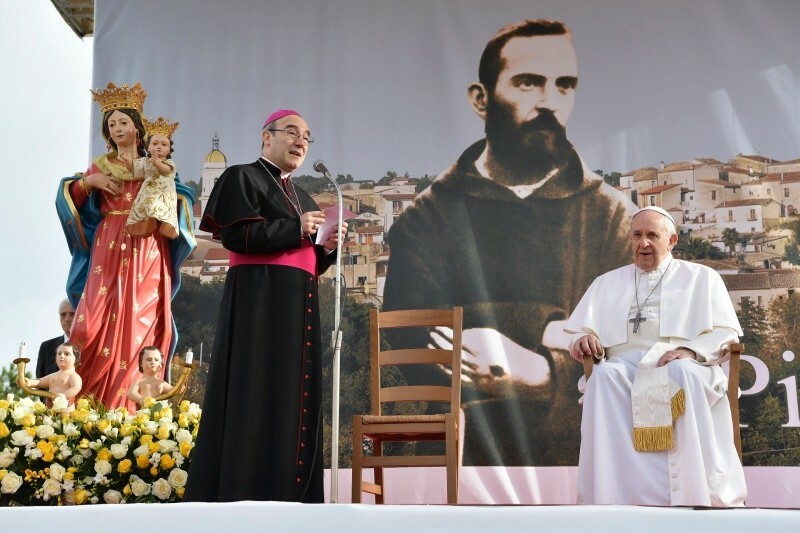 In this community he tempered his own humanity, learned to pray and recognize the Lord's flesh in the poor, until he grew in the following of Christ and asked to be admitted among the Capuchin Friars Minor, thus becoming Pio da Pietrelcina. Here he began to experience the motherhood of the Church, of which he was always a devoted son. He loved the Church, he loved the Church with all its problems, with all its troubles, with all our sins. Because we are all sinners, we are ashamed, but the Spirit of God has called us into this Church that is holy. And he loved the holy Church and sinful children, all of them. This was Saint Pio. Here he meditated with intensity the mystery of God who loved us to give Himself for us (cf. Gal 2:20). Remembering with esteem and affection this Saint disciple of St. Francis, I cordially greet all of you fellow countrymen, your parish priest and the mayor together with the diocesan pastor, Msgr. Felice Accrocca, to the Capuchin community and to all of you who wanted to be present. We find ourselves today in the same ground on which Padre Pio lived in September 1911 to "breathe a little more healthy air". At that time there were no antibiotics and diseases were cured by going back to the village, mother, to eat things that are good, breathe the air well and to pray. So he did, like any other man, like a farmer. This was his nobility. He never denied his country, never denied his origins, never denied his family. At that time, in fact, he resided in his native country for health reasons. That was not an easy time for him: he was strongly tormented in his heart and he feared falling into sin, feeling assaulted by the devil. And this does not give peace, because it moves [to be done]. But do you believe that the devil exists? ... Are you not so convinced? I will tell the bishop to do some catechesis ... Does the demon exist or does not exist? [answer: "Yes!"]. And it goes, it goes everywhere, it puts us inside, it moves us, it torments us, it deceives us. And he [P. Pius], he was afraid that the devil would attack him, push him to sin. With few people he could talk about it both through letters and in the country: to the archpriest only Fr Salvatore Pannullo manifested "almost everything" his "intent to have some lightings" (Letter 57, in Epistolario I, p.250), because he did not understand, wanted clarify what was happening in his soul. He was a good boy! In those terrible moments Padre Pio drew vital life from the continuous prayer and trust he placed in the Lord: "All the ugly ghosts - so he said - that the devil is introducing me into the mind disappear when confident I abandon myself in the arms of Jesus". Here is all theology! You have a problem, you are sad, you are sick: abandoned in the arms of Jesus. And this he did. He loved Jesus and trusted Him. He wrote to the Minister Provincial, saying that his heart felt "attracted by a superior force before joining Him in the morning in the sacrament." "And this hunger and thirst rather than remaining satisfied", after receiving it, "grows [more] more and more" (Letter 31, in Epistolary I, page 217). Padre Pio immersed himself in prayer to adhere ever better to the divine designs. Through the celebration of Holy Mass, which was the heart of every day and the fullness of his spirituality, he reached a high level of union with the Lord. During this period, he received special mystical gifts from above, which preceded the manifestation in his flesh of the signs of the Passion of Christ. Dear brothers and sisters of Pietrelcina and of the diocese of Benevento, you include Saint Pio among the most beautiful and luminous figures of your people. This humble Capuchin friar amazed the world with his life devoted to prayer and to the patient listening of the brothers, on whose sufferings he poured out the love of Christ as a balm. By imitating his heroic example and his virtues, you can also become instruments of God's love, of Jesus' love for the weakest. At the same time, considering his unconditional loyalty to the Church, you will bear witness to communion, because only communion - that is, being always united, in peace among us, communion among us - builds up and builds. A country that quarrels every day does not grow, let not the strength of his strength be boasted "(Jer 9:22). True wisdom does not lie in having great qualities and true strength is not in power. Those who show themselves to be strong and those who respond to evil with evil are not wise. The only wise and invincible weapon is charity animated by faith, because it has the power to disarm the forces of evil. St. Pius fought evil throughout his life and fought it wisely, like the Lord: with humility, with obedience, with the cross, offering pain for love. And everyone is admired; but few do the same. Many speak well, but how many do they imitate? Many are willing to put a "like" on the page of the great saints, but who does as they do? Because the Christian life is not a "like", it is a "gift" to me. Life smells when it is offered as a gift; it becomes insipid when it is kept for itself. And in the first Reading God also explains where to draw the wisdom of life: "He who wants to boast, vain [...] to know me" (v.23). To know him, that is to meet him, as God who saves and forgives: this is the way of wisdom. In the Gospel Jesus reaffirms: "Come to me, all you who are tired and oppressed" (Mt 11:28). Which of us can feel excluded from the invitation? Who can say, "I do not need it" ?. Saint Pius offered his life and innumerable sufferings to make the brothers meet the Lord. And the decisive means to meet him was Confession, the sacrament of Reconciliation. There begins and begins a wise life, loved and forgiven, there begins the healing of the heart. Padre Pio was an apostle of the confessional. Also today invites us there; and he tells us: "Where are you going? From Jesus or your sadness? Where do you come back? From him who saves you or in your slaughter, in your regrets, in your sins? Come, come, the Lord is waiting for you. Courage, there is no reason so grave that it excludes you from its mercy ".